Flavay® is THE ORIGINAL small-cluster of proanthocyanidins complex derived from Vitis vinifera (species of grape seeds) and Pinus maritima (French maritime pine bark). With more than 70 years of scientific research, patents and clinical studies, rigorous manufacturing controls and comprehensive identity-testing to safeguard quality and consistency, Flavay® is the name you can trust for THE ORIGINAL oligomeric proanthocyanidins complex which has been continuously manufactured in France since 1950.
various "extracts" and derivative forms and blends. Unfortunately, many have used our impressive history in unauthorized ways to promote a myriad of derivations. In fact, the other leading brand French pine bark extract (product sample #14, below) is an offshoot. Flavay® is THE ORIGINAL in the "OPCs" category and remains unsurpassed when compared to other leading brands. The following data was extracted from third-party analyses that were conducted for use in litigation against the other leading brand of French pine bark extract. The highest scientific and legal standards were used. A highly-qualified, independent American Laboratory performed five analytical methods to put in qualitative perspective the differences between Flavay® (extracted from both vitis vinifera grape seeds and French Maritime pine bark), the other leading brand of French pine bark extract (sample #14) and ten grape seed extracts in the market. Below are the results of these studies. How it works: High performance liquid chromatography with coulometric electrochemical detection (ECA) separates and quantifies compounds which donate electrons to protect the body from free radical attack. During ECA analysis, electrons produce electrical currents recorded as peaks on a 16-channel chromatogram scale. Higher peaks indicate more antioxidant protection, and non-antioxidant compounds are identified by a flat-line of inactivity. Flavay® scores the highest both as an antioxidant and as a free radical scavenger. [Above:] The similar fingerprints indicate the samples originate from a similar source plant materials, but use different extraction protocols. Flavay® scores the highest as an antioxidant—demonstrating its superior free radical scavenging effect. The other leading brand pine bark extract (sample #14) has significantly lower amounts of antioxidant compounds per unit weight. The rest of the sample is likely to be non-antioxidant inert material. 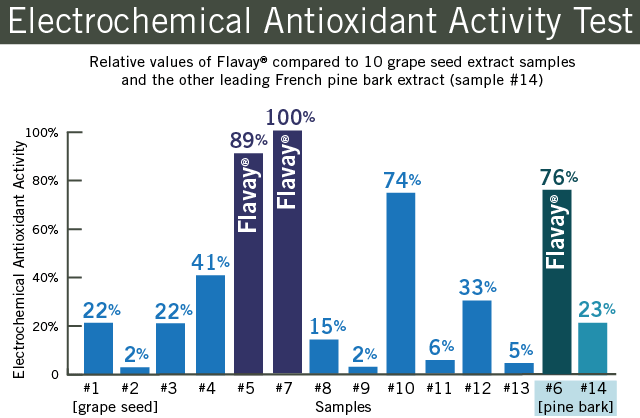 The following Electrochemical Antioxidant (ECA) Activity Tests compare Flavay® to 10 grape seed extract products and to the other leading brand French pine bark extract. Test conditions and amounts of samples were identical. Relative values are displayed on the same scale. [Above:] The ECA test compares the antioxidant activity of the 14 test samples. The ECA test does not measure bioavailability, nor does it indicate what type of molecules were tested. NO OPCs were detected in #13 (a leading brand of grape seed extract)—even though it's aggressively branded as "OPCs." The Thin Layer Chromatography (TLC) test detected NO OPCs in product #13. The ECA test found extremely low antioxidant activity in product #13. How it works: Solubility tests measure quality and purity. Products are dissolved in three different test liquids (methanol, propanol-2 and ethanol), and then the limpidity (clearness, transparency) of the solutions result in a simple and easy-to-measure indicator of quality and purity. Insolubles are an indicator of low quality and/or production problems. Flavay® remained perfectly soluble and limpid (clear), indicating purity and quality. The other brand French pine bark fails. The other brand French pine bark extract (sample #14) was found to contain high amounts of insolubles as it failed to fully dissolve, indicating poor quality and contamination (probably due to its extraction process). The other leading brand only partially dissolves, indicating poor quality and contamination. All the tests confirm the other leading French pine bark extract is in the mediocre category—both for poor antioxidant performance and lack of purity. Consumers need to know that the marketplace is full of imitations, offshoots and derivatives of scientifically-proven natural products. As demonstrated above, this is especially important in the "grape seed extract" and "pine bark extract" category. Without a scientific laboratory, it's practically impossible for retailers and consumers to distinguish inferior so-called "OPCs" products in the marketplace. Specialized tests were needed to discover there were no OPCs in a leading American brand of grape seed extract that's wrongly labeled and aggressively marketed as a branded OPCs product. All of this proves that consumers cannot be assured of the quality, bioavailability and safety of product labeled as "OPCs" or "grape seed extract" or "pine bark extract." All of this proves that consumers cannot be assured of the quality, bioavailability and safety of product labeled as "OPCs" or "grape seed extract" or "pine bark extract."